the scent of green bananas: grommmmmmit! same cupcake, only with a fondant gromit on top. i would have used wensleydale instead of mascarpone, but that would be silly. i'll be in manila for oh, 48 hours, but i'll be back for a morning viewing of "the curse of the were-rabbit". have a great weekend, everyone! ps--is there anything you think i should do whilst i'm in the philippines? besides get a haircut and eat laksa/churros/beard papa puffs? Posted by santos. This entry was posted on 20051007 at 12:07 AM You can skip to the end and leave a response. You're so teribble creativ! My son would love you and your work! I can't decide if I wanna eat that cupcake or love it and hug it and call it boo. Well done! Have a fantastic weekend! ahm, go to sonya's garden? hey, i linked you up. LOL that Grommit he looks too good to eat! get a luxurious massage for cheap! or, at least have some halo-halo. Glad to see you up to your old tricks. Love that Grommit, can't wait to see the flick either! Hmmm, in the Philippines I would go for LECHON for sure and some ADOBO. Have fun! It's the wrong trousers Grommit. So so cute! Enjoy yourself in the phillipines. Ahhh...you're an absolute riot, santos! 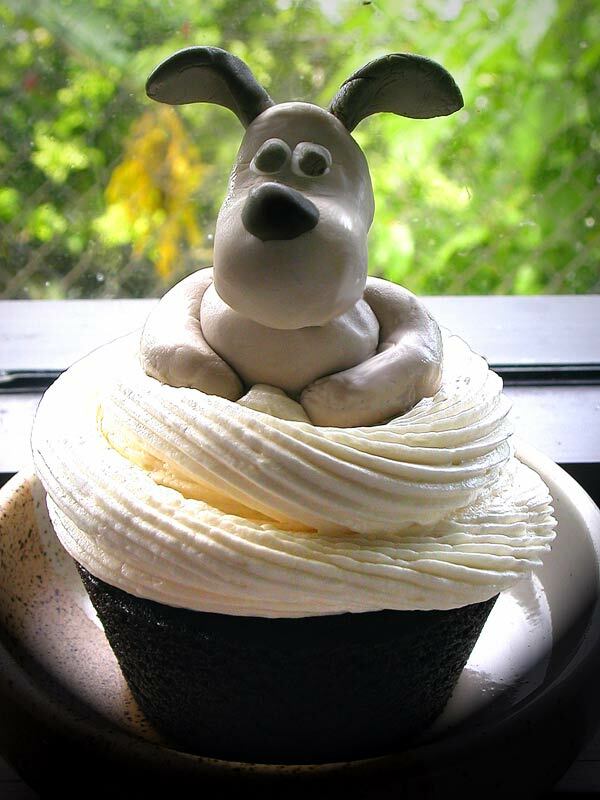 I know everyone has said it, but your Gromit cupcake is really cute! Cute-ness, Santos! Have a great trip - btw I found a papa beard store in Waikiki! hi dilek! i wish i could send one of these by post for your son, but i don't think it would survive :( oh well. i'll have a gromit tutorial up soon. hi milwimper--i really must find out what your name means sometime :) you never know, one day i might send you stuff! hi lorelei--it's a little too small to hug, but not too big to eat! hi sky! thanks! i'll check out your blog soon. hi bee--i admit, gromit's still in the freezer because he *is* too cute to eat. hi maria--the massage came free with the haircut :) i didn't eat halo halo but i had a lot of other good stuff. hi viv! i'm glad to see you are back to blogging a bit. i'll come visit soon! hi reid--i got to the laksa, but missed out on the churros and the beard papas this time. i did get a starbucks coffee jelly though. anthony--bwaaaaaa. cracking comment, there, man that cooks. hi boo, amber and julia--isn't it sweet? i'm so sad to hear that the aardman studios warehouse burned down, so lots of old wallace and gromit memorabilia was lost. hi bex! how was your competition? i hope you've blogged about it, i'd love to read about it. What Starbucks coffee jelly? OMG...you are so lucky...*sigh* It will probably take us years to get it over here. hi keiko! i'm not particular towards wensleydale myself, chocolate or not. i finally saw the movie, hope you enjoy it!